“25 Year Anniversary DVD Special” with interviews of Past and Present Champions of the Arnold Classic and Ms. International Championships! Experience the stories of its grass roots beginnings and its present and future endeavours. Take an in-depth look into the legendary promoting career of James “Jim” Lorimer and his partner Arnold Schwarzenegger and how they built the foundation of one of the most prestigious events in sports history. “25 Year Anniversary DVD Special” with interviews of Past and Present Champions of the Arnold Classic and Ms. International Championships! With 45 sports and events, including 12 Olympic sports, and 175,000 sports fans in attendance, the Arnold Sports Festival has expanded into the world’s largest multi-sport fitness weekend. 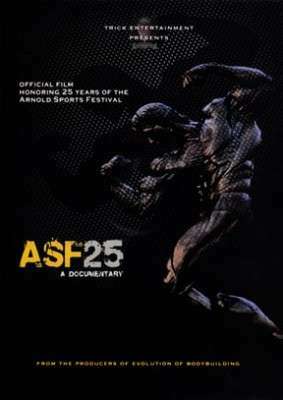 ASF25 celebrates the first 25 years of the Arnold Sports Festival. Experience the stories of its grass roots beginnings and its present and future endeavours. Take an in-depth look into the legendary promoting career of James “Jim” Lorimer and his partner Arnold Schwarzenegger and how they built the foundation of one of the most prestigious events in sports history. Pro Arnold Classic MC, Lonnie Teper was interviewed for this documentary at Golds Gym Venice! LT has been at the MC since 1993 at the ASC! What else is included in this DVD! Flex Wheeler, Vince Taylor, Kai Greene, Branch Warren, Shawn Ray, Kevin Levrone, Adela Garcia, Ronnie Coleman, Rich Gaspari, Mike Ashley, Victor Martinez, Iris Kyle, Jay Cutler, Yaxeni Oriquen etc.